Historical marker #756, located at the Boyle County Courthouse in Danville, commemorates the occupation of the structure as a field hospital during the Civil War. When the Battle of Perryville was fought ten miles from Danville on October 8, 1862, more than 7,500 soldiers were killed and wounded. Perryville was overwhelmed by these casualties and wounded and sick soldiers soon filled surrounding communities. Danville was no exception. By mid-October, more than 3,500 sick Union soldiers filled the town's churches, schools, businesses, and homes. Among the occupied structures was the Boyle County Courthouse. 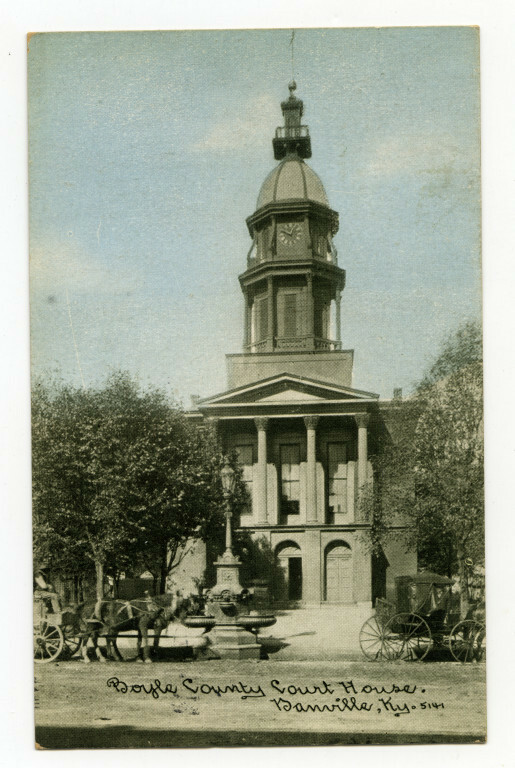 A courthouse was first constructed at the corner of Main and Fourth streets in 1842. 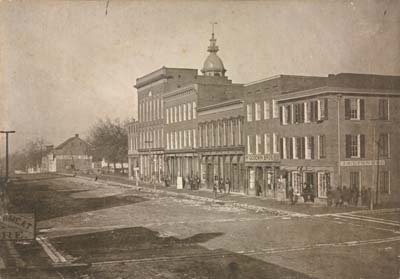 In February 1860, however, much of downtown Danville, including the courthouse, was burned in a large fire. Citizens rebuilt, and the current courthouse was constructed in 1862, just in time for the Battle of Perryville. When Union soldiers arrived in Danville after the battle, they quickly filled this structure with sick soldiers. Dr. A. N. Read of the United States Sanitary Commission found that "the wants of the sick [in Danville are] as urgent as those of the wounded at Perryville. The Courthouse was literally packed." Since many of these soldiers had not eaten for more than a day, Read made soup for the soldiers. He soon encountered difficulties. First, Read could not find any beef, but a citizen supplied a cow. Next, because of a recent drought, he could not find enough water because "the wells were all dry." However, the same citizen who had donated the cow hauled water to the courthouse from several miles away. Third, Read could not find any kettles, because the Confederates had taken all of them before the battle. After five hours of scrounging, Read overcame these conditions and had two 32-gallon kettles of soup cooking on the courthouse lawn. In late October, one Danville resident wrote a relative that "We have three thousand five hundred Federal soldiers and something over a hundred confederates [sic] in town. You can imagine what Danville is with that much sickness. The court house, seminary buildings, every church and unoccupied house, private dwellings and all are full to overflowing." By mid-1863, most of the Danville buildings had been cleared of sick and injured troops. The courthouse, however, was occupied by Union troops for many months after the Battle of Perryville. Likely used as a headquarters building, the county court had to meet elsewhere to conduct county business. Although it was occupied during much of the Civil War, this structure survived. Today, it stands as a testament to what the community endured after Kentucky's largest Civil War battle. Boyle County Courthouse, Danville: Constructed in 1862 after a fire destroyed much of downtown Danville, the Boyle County Courthouse was a makeshift hospital for ill Union soldiers after the Battle of Perryville. Courtesy of the Kentucky Historical Society. 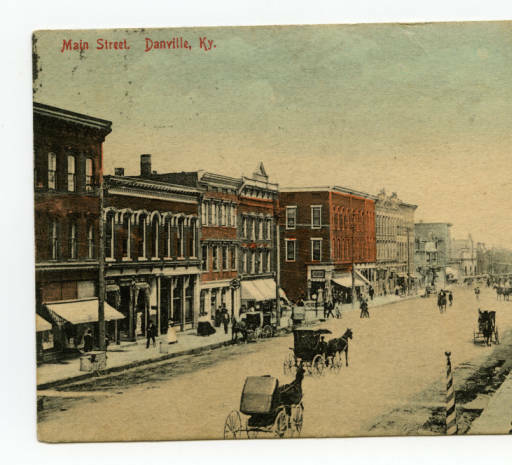 Main Street, Danville, Kentucky: This c. 1910 postcard depicts Main Street in Danville, Kentucky. The Boyle County Courthouse is located along this street. Courtesy the Kentucky Historical Society. 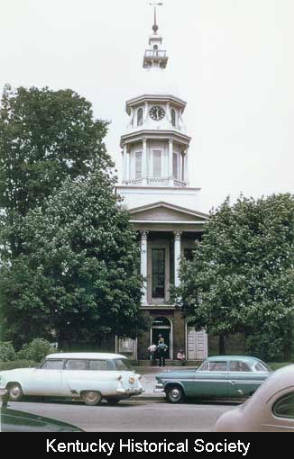 Boyle County Courthouse, Danville, 1954: A 1954 photograph of the Boyle County Courthouse in Danville. Located on Main Street, this building served as a makeshift hospital after the Battle of Perryville. Courtesy the Kentucky Historical Society. Downtown Danville, Kentucky: The top of the Boyle County Courthouse can be viewed over the top of these buildings in downtown Danville. Image courtesy of Centre College. Boyle County Courthouse: The Boyle County Courthouse, located in downtown Danville, was a makeshift hospital after the Civil War. Courtesy the Boyle County Public Library. 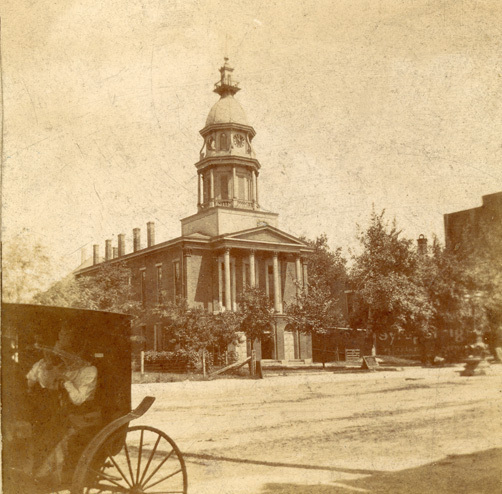 Sanders, “Courthouse a Hospital,” ExploreKYHistory, accessed April 22, 2019, https://explorekyhistory.ky.gov/items/show/102.